The local racing community came together at Tamworth on Tuesday over a cuppa and a chat. ‘Racing Mates’ is a peer support group, established by Racing NSW in 2016. Successful horse trainer and Racing Mates ambassador, Pat Webster, has described the initiative as an excellent opportunity for those in the industry to get to know each other. “We’ve run many of these morning tea get-togethers previously, and it is a great opportunity for the racing community to come together for a chat,” Mr Webster said. “Research has found that effective support offered from peers and colleagues can aid significantly in coping with stress and difficult situations. “There is nothing better than talking to someone who understands where you're coming from," Mr Webster, also an accredited Racing NSW drug and alcohol mentor, said. 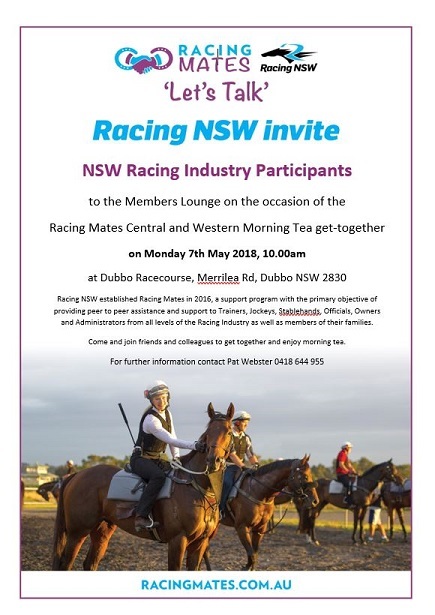 Racing Mates will hold the next morning tea get-together Dubbo on Monday, May 7th. The Dubbo morning tea, to be held at Dubbo Racecourse on Merrilea Rd, Dubbo, invites participants from the Western and Central West Racing Districts. The Dubbo morning tea coincides with Dubbo Turf Club’s ‘Lifeline Boys Day Out’ race meeting which will be held the previous day, Sunday 6th May. The special race meeting recognises men's mental health issues and is proudly supported by Racing Mates, along with Black Dog, Blue Elephant, Headspace, Men Of League and Lifeline. For further information contact Pat Webster on 0418 644 955.